Created for students and hobby artists, Faber-Castell Goldfaber Color Pencils are also ideal for more advanced artists. 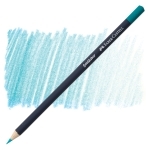 Their 3.3 mm cores lay down smudgeproof, water-resistant, lightfast marks for sketches, shading, and hatching. Highly pigmented cores are soft yet break-resistant. ® Faber-Castell is a registered trademark.™ Goldfaber is a trademark.